A nutrient profiling system for the (re)formulation of a global food and beverage portfolio. Antonis Vlassopoulos · Gabriel Masset · Veronique Rheiner Charles ·Cassandra Hoover · Caroline Chesneau‑Guillemont · Fabienne Leroy ·Undine Lehmann · Jörg Spieldenner · E‑Siong Tee · Mike Gibney ·Adam Drewnowski. Eur J Nutr DOI 0.1007/s00394-016-1161-9. Conclusions: The NNPS sets feasible and yet challenging targets for public health-oriented reformulation of a varied product portfolio; its application was associated with improved nutrient density in eight major food categories in the USA and France. Funding: The research presented herein was funded by Nestec Ltd, which is a wholly owned affiliate of Nestlé S.A. 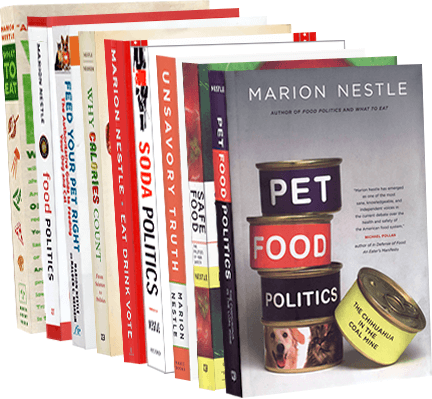 The first eight authors are employed by Nestlé. Comment: the paper is the basis of a Nestlé infographic. Including whey protein and whey permeate in ready-to-use supplementary food improves recovery rates in children with moderate acute malnutrition: a randomized, double-blind clinical trial. Heather C Stobaugh, Kelsey N Ryan, Julie A Kennedy, Jennifer B Grise, Audrey H Crocker, Chrissie Thakwalakwa, Patricia E Litkowski, Kenneth M Maleta, Mark J Manary, and Indi Trehan. Am J Clin Nutr First published February 10, 2016, doi: 10.3945/​ajcn.115.124636. Conclusion: This study highlights the importance of milk protein in the treatment of MAM, because the use of a novel whey RUSF resulted in higher recovery rates and improved growth than did soy RUSF [ready-to-use supplemental food], although the whey RUSF supplement provided less total protein and energy than the soy RUSF. Funding for this project was provided by the Danish Dairy Research Foundation, Arla Foods Ingredients Group P/S, and the US Dairy Export Council. IT was supported by the Children’s Discovery Institute of Washington University in St. Louis and St. Louis Children’s Hospital…The funders had no role in the design or implementation of the study and no role in the analysis or interpretation of the data. Conclusion If all members of the UK 12-year-old population chewed SFG frequently (twice a day), the potential cost savings for the cohort over the course of one year were estimated to range from £1.2 to £3.3 million and if they chewed three times a day, £8.2 million could be saved each year…This study shows that if levels of SFG usage in the teenage population in the UK could be increased, substantial cost savings might be achieved. Declaration: This study and writing support for the manuscript were funded by Wrigley Oral Healthcare Programme. Conclusion: Here we present 12 points of evidence supporting the use of low-carbohydrate diets as the first approach to treating type 2 diabetes and as the most effective adjunct to pharmacology in type 1. Disclosure: AA is consultant/member of advisory boards for the Dutch Beer Knowledge Institute, NL, Global Dairy Platform, USA, Jenny Craig, USA, McCain Foods Limited, USA, McDonald’s, USA, and Gerson Lehrman Group, USA (ad hoc consultant for clients). He is recipient of honoraria and travel grants as speaker for a wide range of Danish and international concerns. He has conducted research funded by a number of organizations with interests in the food production and marketing sector. RDF writes reviews for Fleishman-Hillard, whose client is the Corn Refiners Association and he has received grant support from the Veronica and Robert C. Atkins Foundation. EJF has received grant support from the Veronica and Robert C. Atkins Foundation. TK sits on an advisory board for Eli Lilly and gives lectures for Lilly about the diabetic diet. NW has written popular-audience books on low-carbohydrate diets and is a consultant and promoter for Leberfasten/Hepafast, a specific low-carbohydrate meal replacement program. JW is on the Scientific Advisory Board of Atkins Nutritionals Inc. with paid retainer, honoraria, and travel costs. None of the other authors have anything to declare. Comment: The Atkins Diet is low-carbohydrate. Conclusions. A large weight-management program is effective for achieving lifestyle changes associated with diabetes prevention. Such programs could significantly increase the availability of diabetes prevention programs worldwide making an immediate and significant public health impact. Funding: This study was funded by Weight Watchers International. It’s close to a year since I first started collecting these studies. When the year is up, I will do some analysis. Until then, the bottom line is that it’s easier to find industry-funded studies with results favorable to the sponsor than it is to find those that are not. Thanks to Andy Bellatti for noticing this at his local Las Vegas Whole Foods. This reminds me so much of the Low-Carb craze way back in 2005. 1. Calories in, Calories out! 2. Eat less. I cut out beer and ice cream. 3. Get a Labrador retriever and walk everyday. If you don’t the dog will drive you crazy and probably destroy your house. I got my first Lab in 2002 and weighed 240. I am on my second Lab and now continue to weigh about 210 after having lost 35 pounds by 2006, and have crept up about 5 pounds. He could make a fortune. Just think: the “Get a Lab” diet—a guaranteed success! The trial, conducted by authors who previously published a meta-analysis that came to the same conclusion, told people to eat either a low-carbohydrate diet of less than 40 grams a day (the amount of sugar in one 12-ounce soda) or a “low-fat” diet of 30% of calories from fat or less. They didn’t do either, of course (for one critic’s analysis, see examine.com). I put quotes around “low-fat” because 30% of calories is not exactly what I would call low—lower, for sure, but not low. After a year, the low-carb dieters lost about 3.5 kg more than did the “low-fat” dieters. They also showed greater improvements in their risk factors for cardiovascular disease. The folks eating the low carbohydrate diet…were eating less, and probably a lot less. It’s easier for some people to lose weight if they cut out whole categories of food, in this case, carbohydrates. But is this a long-term solution? For that, we need to see results for several years. Studies that examine the effects of different kinds of diets—and there have been many—typically find that all work to the extent that they cut calories, but that people have trouble sticking to extreme diets, which the low-carb one was in this study. Personally, I like carbs and would rather cut my calories some other way, but that’s just me. The bottom line: if you want to lose weight and are having trouble doing it, you need to eat less. This profoundly boring conclusion, discussed at length in my book with Malden Nesheim, Why Calories Count: From Science to Politics, has just been confirmed by yet another meta-analysis. This one doesn’t seem to be getting much press, however. It reports significant weight loss with any low-carbohydrate or low-fat diet. Weight loss differences between individual named diets were small. This supports the practice of recommending any diet that a patient will adhere to in order to lose weight. An accompanying editoria, “A Diet by Any Other Name Is Still About Energy,” points out that study investigators only rarely analyze for how well participants in these studies actually adhere to the different diets, and for how long. This makes it impossible for readers to figure out whether the weight loss was due to the specific components excluded from the diet or to the level of adherence. In other words, whatever helps you eat less, helps you lose weight. Go for it. Thanks to Deborah Szekeley for forwarding this link to an evening in the 1950s when Sid Caesar, who died last week, went to dinner with Imogene Coca at a health food restaurant in New York. Perhaps it is still open? Yoni Freedhoff. The Diet Fix: Why Diets Fail and How to Make Yours Work. Harmony Books, 2014. Ordinarily I don’t pay much attention to diet books but this one comes from the Canadian obesity physician, Dr. Yoni Freedhoff, whose Weighty Matters blog is fun to read and well worth following. The key to healthy dieting, he says, is to avoid dieting’s seven deadly sins: hunger, sacrifice, willpower, restriction, sweat, perfectionism, and denial. Instead, you are to reset your relationship with food forever, starting with a 10-day preliminary experiment in which you get ready, keep a diary, banish hunger, cook, think, exercise, indulge, eat out, and set goals. Then you move forward, one day at a time. “You absolutely CAN do this,” he says. This is a seriously mindful weight-loss program that works well for his patients. It ought to. The book even comes with recipes. How to get people to buy healthier food: cardboard cutouts? Can it really be this easy? Morrison’s, a grocery chain in the U.K., put cardboard cutouts of doctors near the produce section. A new pilot scheme in a Morrisons store in Salford, using cardboard cut-outs of local GPs in the fresh produce aisles delivered a 20% rise in the sales of fresh fruit and a 30% uplift for frozen fruit. All of this is part of Great Britain’s Public Health “Responsibility Deal,” which aims to enlist businesses to voluntarily promote health objectives. The Responsibility Deal embodies the Government’s ambition for a more collaborative approach to tackling the challenges caused by our lifestyle choices. Organisations signing up to the Responsibility Deal commit to taking action voluntarily to improve public health through their responsibilities as employers, as well as through their commercial actions and their community activities. Organisations can sign up to be either national partners or local partners. The principles and ambitions of the Responsibility Deal are set out in its core commitments and supporting pledges. This is all it takes? Really? Why do I think this won’t work nearly as well in America? We have a long way to go, says the USDA. What might work? Celebrities? Sports figures? Political figures?